The annual Texas Fatherhood Summit hosted by Child and Family Research Partnership at The University of Texas at Austin LBJ School of Public Affairs and the Texas Department of Family and Protective Services Prevention and Early Intervention Division brings together public and private sector professionals who seek research-based best practices and innovations to best support dad, mom, and their children. Who should attend the Texas Regional Fatherhood Summit? 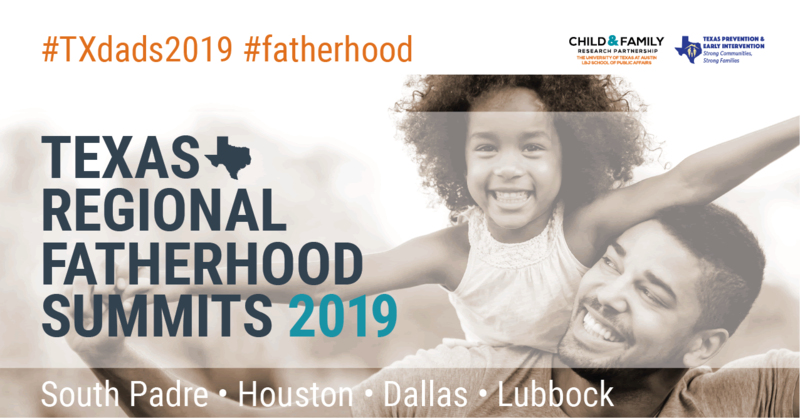 The Texas Regional Fatherhood Summits are for professionals who engage with and/or impact policies about fathers and families, including local policymakers and agencies, researchers, and representatives from parent and family programs, nonprofits, and other community groups. When does registration open? Registration for each location is separate with different opening dates starting in March 2019. See below for registration open dates and links. Is there a fee to attend? The Texas Fatherhood Summit is hosted by Texas DFPS Prevention and Early Intervention Division and The University of Texas at Austin Child and Family Research Partnership. There is no fee to attend. However, there is a maximum of 5 attendees from each organization per location, based on order of registration. How do I stay informed? Be sure to sign-up for the CFRP email list to receive updates at http://bit.ly/cfrpemail and follow us on Facebook and Twitter. Do you have a flyer I can share with my colleagues? Yes, please share with your fellow policymakers, program providers, and community representatives! Click to download the 2019 flyer with locations and registration info (PDF). Are you seeking speakers? We have a wonderful, custom agenda planned for each location and are not soliciting speakers. Are there opportunities for organizations to have a table? As at previous summits, there will be opportunities for attendee organizations only to provide resource materials on shared tables to inform other attendees of how fathers are supported in their community and the state. Promotional/sales materials are not allowed. Click to download the shared resource table request form (PDF). Registration now open: Houston / League City registration. Dallas registration will open April 22. Lubbock registration will open May 1. Please contact CFRP with questions.